Join us for a relaxing and creative experience while you are waiting to get back to work! 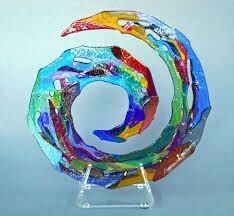 Create a lovely fused glass abstract work of art using a selection of clear and colored fusible glass. Perfect for absolute beginners! This is the perfect activity for families, but absolutely no children under the age of 8. Only ticket holders will be permitted in the event. Children under the age of 12 MUST be accompanied by a registered adult. The projects will be be left at VisArts for the firing process and will be ready for pick up on February 22. VisArts will keep the pieces until February 28.